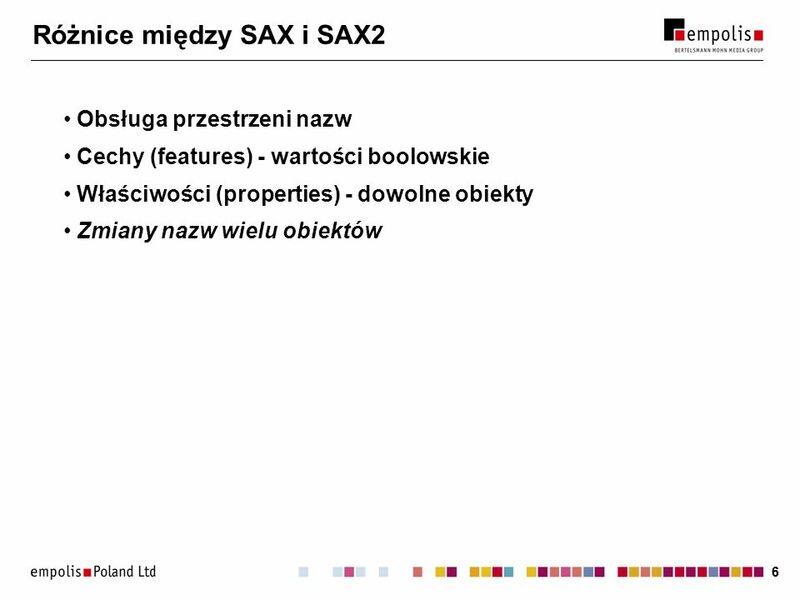 Obsługa przestrzeni nazw Cechy (features) - wartości boolowskie Właściwości (properties) - dowolne obiekty Zmiany nazw wielu obiektów Changes from SAX 1.0 to SAX 2.0beta The following interfaces and classes have been deprecated, and will be removed from a future version of SAX; they should be used only for interaction with SAX1 drivers or applications: org.xml.sax.Parser org.xml.sax.DocumentHandler org.xml.sax.AttributeList org.xml.sax.HandlerBase org.xml.sax.helpers.ParserFactory org.xml.sax.helpers.AttributeListImpl The following interfaces and classes have been added to SAX2: org.xml.sax.XMLReader (replaces Parser) org.xml.sax.XMLFilter org.xml.sax.ContentHandler (replaces DocumentHandler) org.xml.sax.Attributes (replaces AttributeList) org.xml.sax.SAXNotSupportedException org.xml.sax.SAXNotRecognizedException org.xml.sax.helpers.AttributesImpl (replaces AttributeListImpl) org.xml.sax.helpers.NamespaceSupport org.xml.sax.helpers.XMLFilterImpl org.xml.sax.helpers.ParserAdapter org.xml.sax.helpers.XMLReaderAdapter org.xml.sax.helpers.DefaultHandler (replaces HandlerBase) org.xml.sax.ext.LexicalHandler (since removed) org.xml.sax.ext.DeclHandler (since removed) SAX2 contains complete Namespace support, which is available by default from any XMLReader. An XML reader can also optionally supply raw XML 1.0 names. See the Namespaces page for more details. 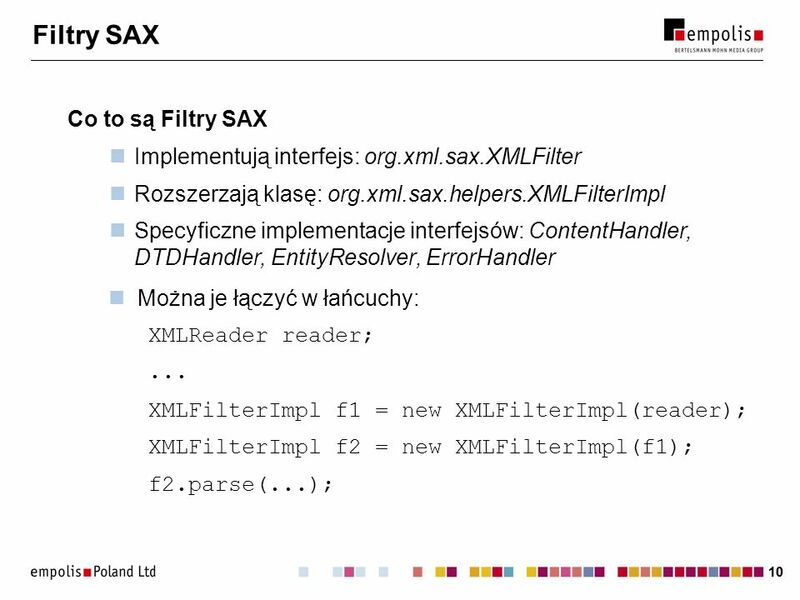 An XML reader is fully configurable: it is possible to attempt to query or change the current value of any feature or property. Features and properties are identified by fully-qualified URIs, and parties are free to invent their own names for new extensions. See the Features and Properties page for more details. The ContentHandler and Attributes interfaces are similar to the deprecated DocumentHandler and AttributeList interfaces, but they add support for Namespace-related information. ContentHandler also adds a callback for skipped entities, and Attributes adds the ability to look up an attribute's index by name. The ParserAdapter class makes a SAX1 Parser behave as a SAX2 XMLReader. 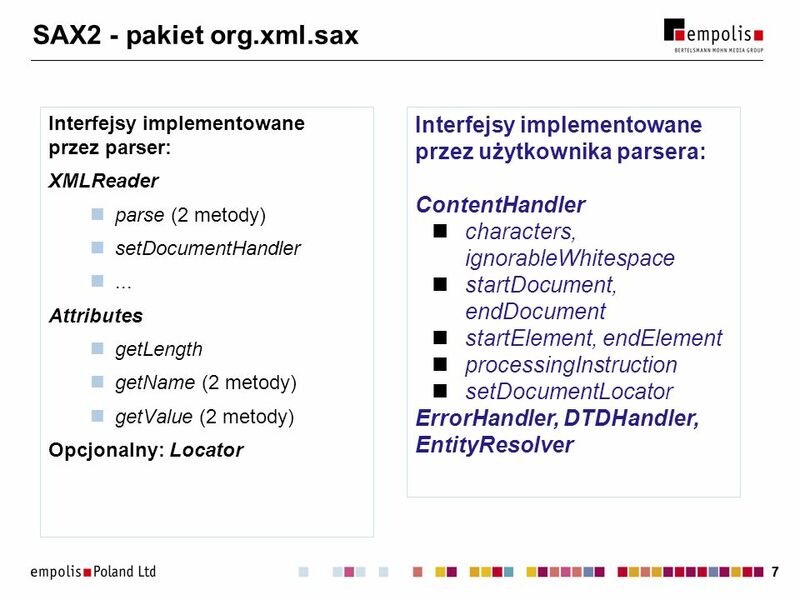 The XMLReaderAdapter class makes a SAX2 XML reader behave as a SAX1 parser. These two classes should ease the transition from SAX1 to SAX2 by allowing SAX1 drivers and clients to co-exist with SAX2 drivers and clients in the same application. 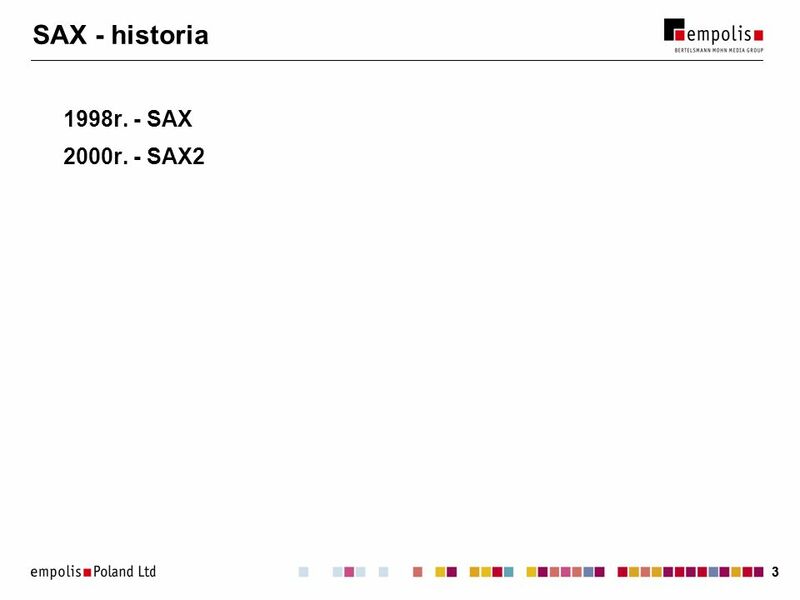 20 SAX  DOM Przetwarzanie wsadowe. Całe drzewo dokumentu ładowane do pamięci. Oszczędny czasowo i pamięciowo. Kosztowny czasowo i pamięciowo. Dobry do wyławiania z dokumentu wybranych elementów. Pozwala wędrować po drzewie dokumentu. Dokument tylko do odczytu Pozwala tworzyć i modyfikować dokumenty. 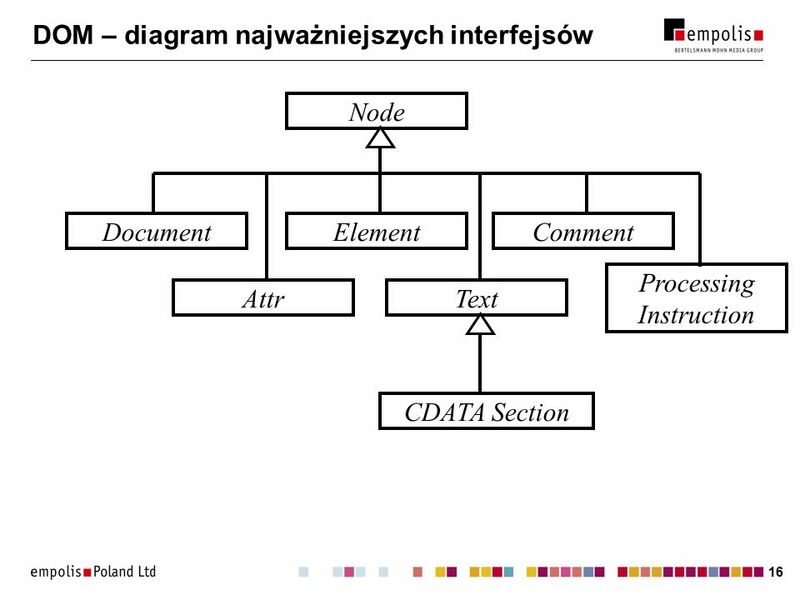 Pobierz ppt "SAX i DOM wykorzystanie XML-a we własnych aplikacjach"
Definiowanie typów dokumentów Część 2: XML Schema 16 października 2003. 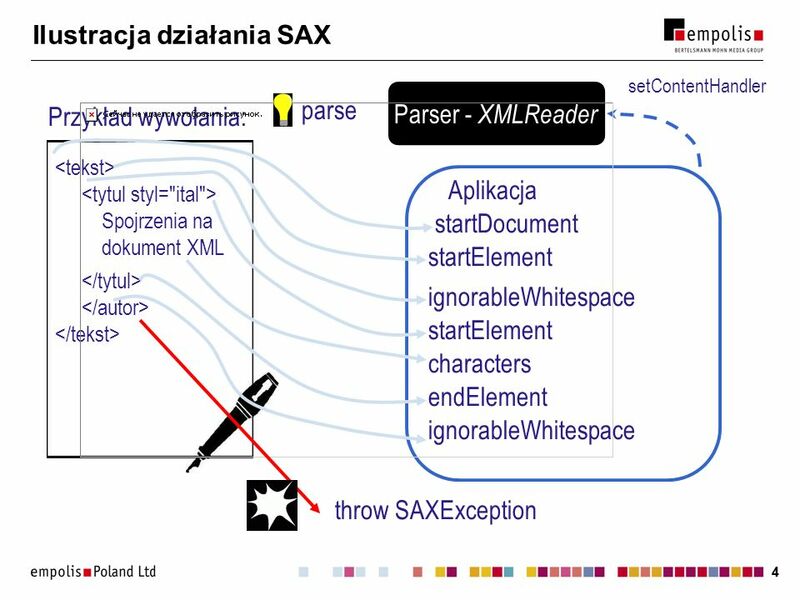 Wykorzystanie XML-a we własnych aplikacjach Wykorzystanie XML-a we własnych aplikacjach2 Modele dostępu do dokumentu XML Pozwalają programistom. 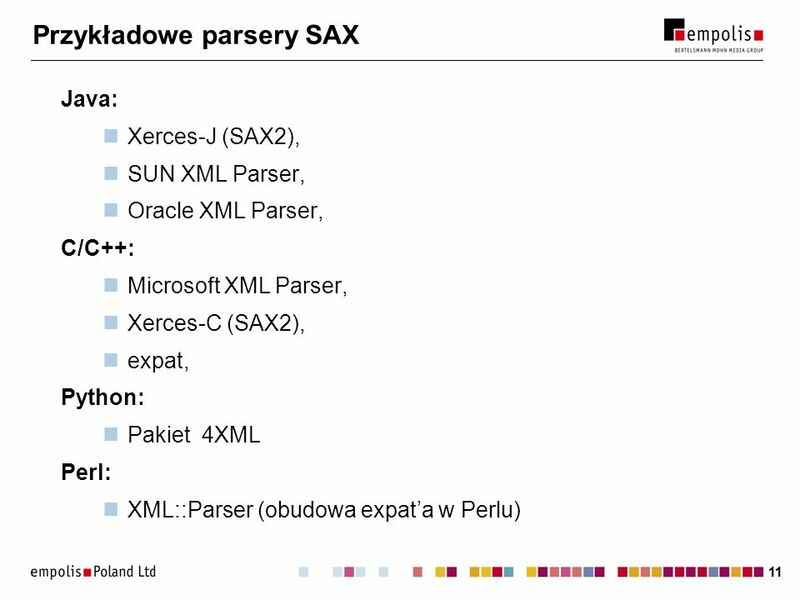 XML – standardy pokrewne XML – standardy pokrewne2 Standardy wykorzystywane w przetwarzaniu dokumentów XML XPath – XML Path Language. XSLT. XSL Extensible Stylesheet Language 6 listopada 2003. 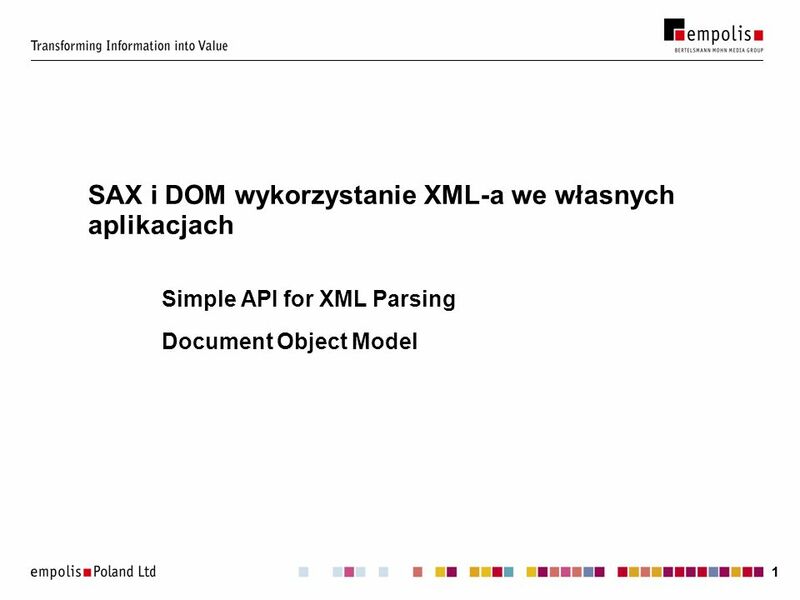 11 Dowiązania w XML-u. 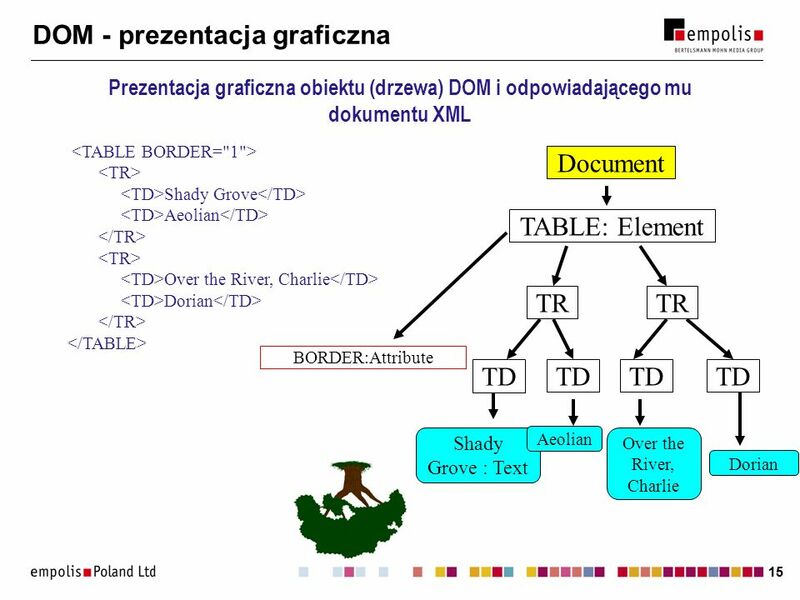 Formy architektoniczne.. 22 XLink – dowiązania w XML-u Linki jakie znamy (HTML): łączą dwa dokumenty: źródło i cel linku, źródłem. Wykład 4 Dr Aneta Polewko-Klim Dr Aneta Polewko-Klim https://play.google.com.